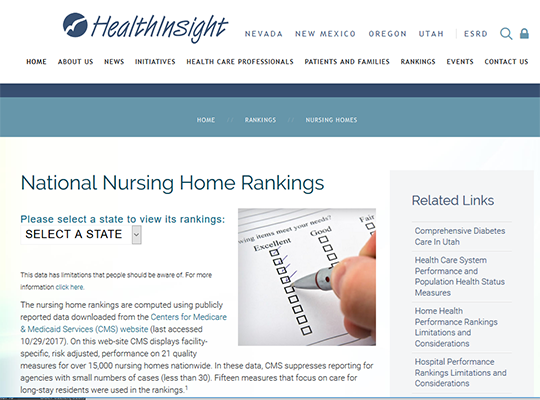 National Nursing Home Rankings provides national rankings for nursing homes calculated using publicly reported data downloaded from the Centers for Medicare & Medicaid Services (CMS) Nursing Home Compare website. The Nursing Home Compare data set contains facility-specific performance data on more 21 measures for over 15,000 nursing homes nationwide. For the National Nursing Home Ranking, nursing homes are ranked on their average performance for quality of care on 15 of the 21 measures (15 measures that focus on care for long-stay residents).